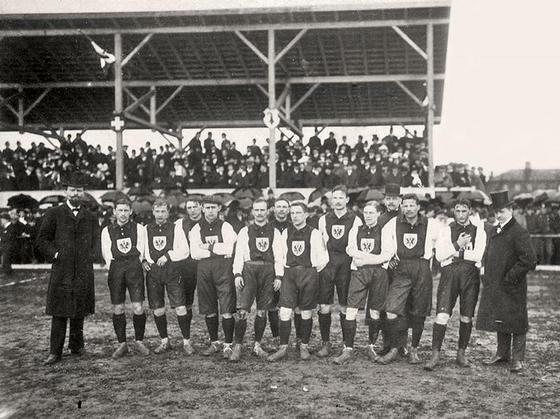 The first squad: Baumgärtner, Becker, Hensel, Baumgarten, A. Hiller, Hempel, Förderer, Jordan, K. Ludwig, Kipp, Weymar. Switzerland: Dreyfuss, Henneberg, Hug, Strauss, Megroz, Lehmann, Rubli, Pfeiffer, Kämpfer, Isenegger, Kobelt. Germany: Baumgarten, Jordan, Hempel, K. Ludwig, A. Hiller, Weymar, Hensel, Förderer, Kipp, Becker, Baumgärtner. Goals: 0:1 Becker (6), 1:1 Kämpfer (21. ), 2:1 Jordan (28., owngoal), 3:1 Pfeiffer (32. 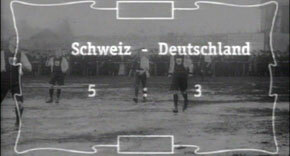 ), 3:2 Förderer (52. ), 4:2 Pfeiffer (57. ), 4:3 Becker (69. ), 5:3 Kämpfer (89.). 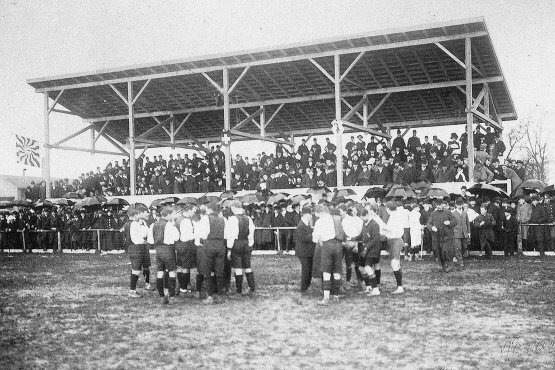 The very first match: Sunday, April 5, 1908, at 3 PM. 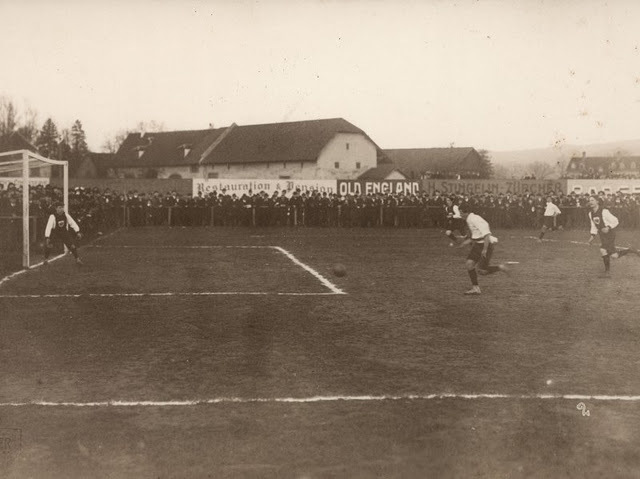 Fritz Förderer, the second scorer. 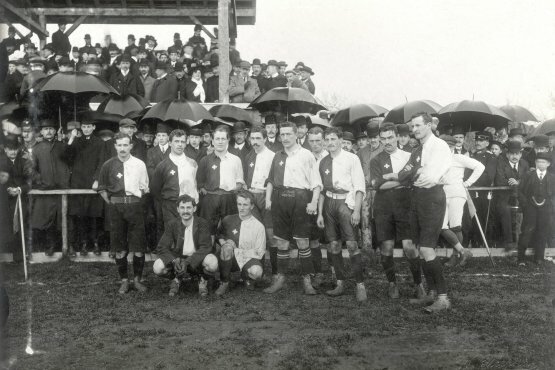 Between 1899 and 1901, prior to the formation of a national team, there were five unofficial international matches between different German and English selection teams, which all ended as large defeats for the German teams. 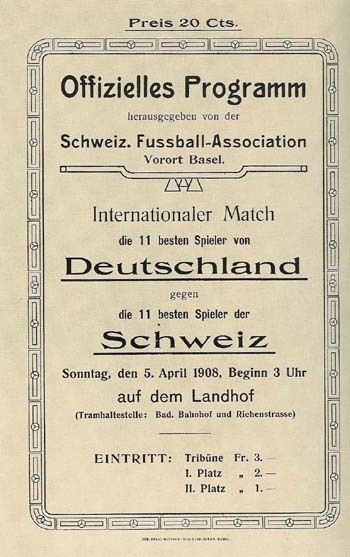 Eight years after the establishment of the German Football Association (DFB), the first official match of the Germany national football team was played on 5 April 1908, against Switzerland in Basel, with the Swiss winning 5–3. 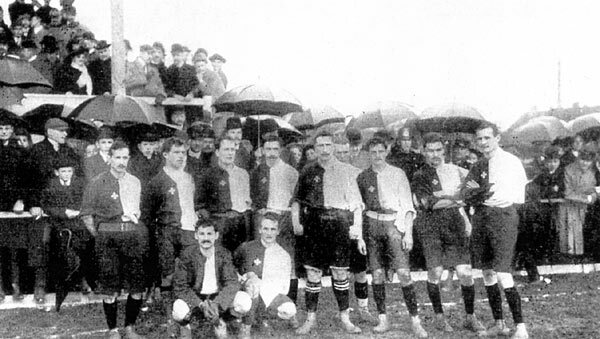 At that time, the players were selected by the DFB as there was no dedicated coach (Source: Wikipedia). 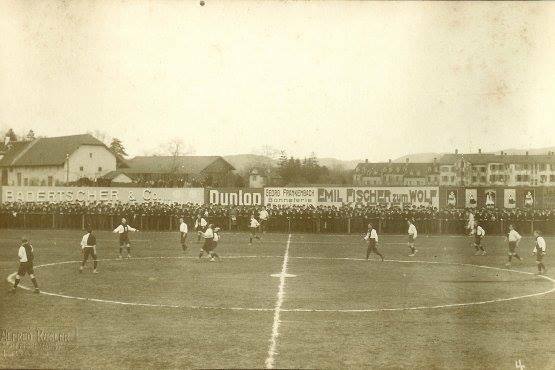 This entry was posted in 0-9.000, 1908, 1908-1909, Away match, Basel, Friendly match, Switzerland, Team photo. Bookmark the permalink.